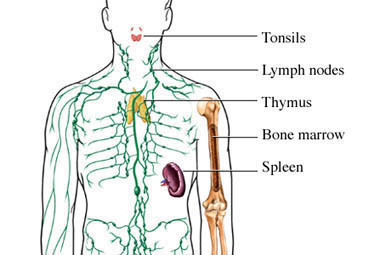 Lymphomas are cancers of the lymphatic system. The lymphatic system drains excess fluid from tissues. It also helps protect against infections. Non-Hodgkin lymphoma is a name that applies to many types of lymphomas. These types are based on the cell that is involved and the patterns of growth. These cancers are different from Hodgkin lymphoma . Cancer occurs when cells in the body divide out of control or order. If cells keep dividing, a mass of tissue forms. These are called growths or tumors. If the tumor is cancer, it is called malignant. It can invade nearby tissue and spread to other parts of the body. The cause of non-Hodgkin lymphoma is unknown. DNA mutations that occur after birth may be related to this cancer. These mutations can occur as a result of exposure to radiation or cancer-causing chemicals. They may also occur with age or for no apparent reason. You will be asked about your symptoms and medical history. A physical exam will be done. It will include an exam of your lymph nodes. For some indolent lymphomas, no treatment may be needed for some time. Treatment is needed if the tumor begins to cause symptoms. Treatment may also be needed if the tumor becomes too large to tolerate, or shows signs of becoming aggressive. Chemotherapy involves the use of drugs to kill cancer cells. It may be given by pill, injection, or via a catheter (tube). The drugs enter the bloodstream and travel through the body. They will kill mostly cancer cells. Some healthy cells may also be killed. Radiation is directed at the tumor from a source outside the body to kill the cancer cells. You may be able to use your own bone marrow. Bone marrow is removed, treated, and frozen. Large doses of chemotherapy and/or radiation therapy are then applied to kill the cancer cells. After treatment, the bone marrow is replaced via a vein. Marrow may also be donated by a healthy person. Stem cells are immature cells that produce blood cells. They are removed from circulating blood before chemotherapy or radiation treatment. These cells are then replaced after treatment. The cells can then develop new, healthy cells. These medications or substances are made by the body. They increase or restore the body’s natural defenses against cancer. Interferons are one type of biological therapy. They interfere with the division of cancer cells and can slow tumor growth. Interferons are produced by the body. They can also be made in a lab to treat cancer and other diseases. Sometimes, a drug or antibody that is directed at the lymphoma is linked to a radioactive substance. It will deliver a focused dose of radiation to the tumor. There are no guidelines for preventing non-Hodgkin lymphoma. To reduce your risk, avoid exposure to chemicals such as herbicides, pesticides, benzene, and chlorinated organic solvents. If you have celiac disease , maintain your gluten-free diet. This diet will minimize stimulation of your immune system from exposure to gluten. Library resources related to non-Hodgkin's lymphoma. The detailed guide includes descriptions of the causes, risk factors, prevention, diagnosis, staging, treatments, and what's new in Hodgkin disease research. Leukemia & Lymphoma Society helps patients with blood cancers live better, longer lives. LLS is the world's largest voluntary health agency dedicated to blood cancer. LLS funds lifesaving blood cancer research around the world and provides free information and support services. PDF document detailing information on lymphomas for patients and caregivers. MedlinePlus search on "non-hodgkin lymphoma"
Link to a search of the MedlinePlus database for health information on non-Hodgkin lymphoma. MedlinePlus links are managed by medical librarians at the National Library of Medicine. Plain language health information from Kidshealth.org on Non-Hodgkin Lymphoma. An electronic booklet about medical care for Non-Hodgkin Lymphoma from the National Cancer Institute. The booklet includes information on risk factors, diagnosis, staging, treatment, follow-up care, and cancer research.